Greetings friends and fellow crafters, LeeAnn here with my first guest post with the D2BA team. Let me tell you it is such an honor to be chosen to work with these great stamps and dies. For this project I have gone with using the Flip Flops stamp set. The first thing I did was prepare my base. This was made using a White A2 size 110 lb card stock and an oval cut out, followed by a piece of Seafoam layering weight with a slightly larger cut out. 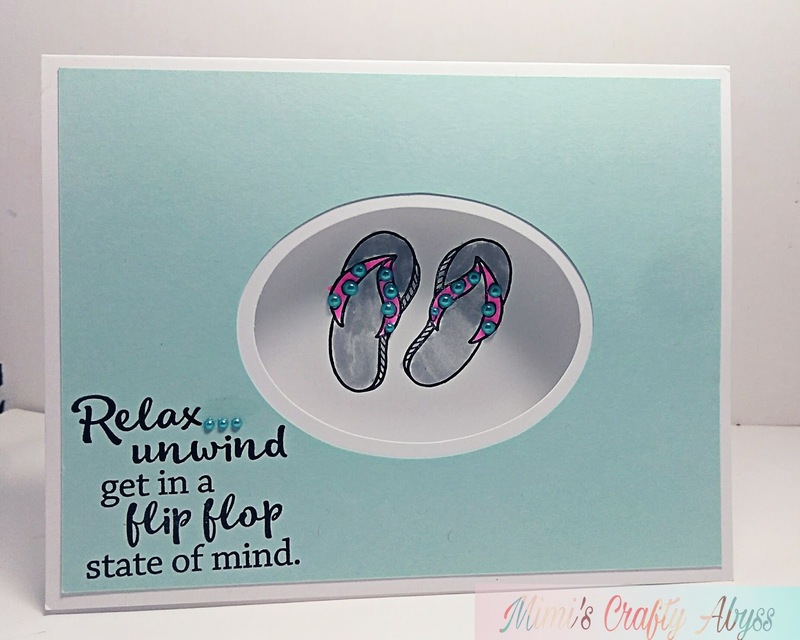 Using my stamp positioner and Memento Tuxedo Black ink I stamped the flip flops and the sentiment. Using Zig Clean Color Real Brush Markers in 091 Light Gray and 003 Florescent Pink I colored the flip flops. With a few well placed enamel dots on the flip flops and the ... in the sentiment, this Clean and Simple project was complete. I hope you have enjoyed my project today. Again, thank you to D2BA for allowing me this guest designer spot.